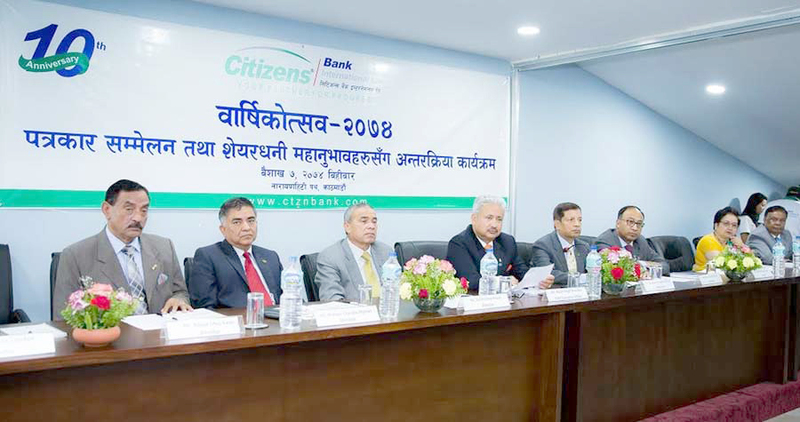 Citizens Bank International has launched ‘Citizens Dasak Bachat Khata’. Shankar Prasad Sharma, Chairman of the bank launched the account on April 20 amid a program organized to mark 10th anniversary of the bank in the central office. “Under the scheme, depositors will be provided free ABBS, free D-mat account services and 50 % concession on locker charge,” said Ganesh Raj Pokharel, Deputy CEO and spokesperson of the bank. On the occasion of the 10th anniversary, the bank has provided financial support to various sectors including education, social, health, sport, religion and music under its corporate social responsibility. The bank informed that it supported a total of Rs 2.88 million to various 16 organisations on the occasion. Besides that, the bank has also set water treatment plant in Nepal Traffic Police Office at Durbarmarg, Kathmandu. It also organized meal program for 50 senior citizens in Nisahaya Sewa Sadan, Shantinagar, Kathmandu. On the same occasion, the bank organized blood donation program in which nearly 60 individuals donated their blood. Moreover, in the eye donation and kidney donation program organized by the bank, three individual donated their organs. In a bid to make contribution in sport, the bank organized ‘Citizens Golf Tounament-2017’. It also informed of organizing ‘Fifth Citizens Lawn Tennis Tournament’ in near future. On the same occasion, the bank also organized a march in the morning of April 20 in a bid to raise awareness on banking practices. Citizens Bank Limited had got approval from Securities Board of Nepal (SEBON) for Application Supported by Blocked Amount (ASBA) system on January 22 and has been providing ASBA service for all public issues since. The bank has been charging Rs 100 per application for Initial Public Issue (IPO) and Further Public Issue (FPO) shares, and now, the company has reduced its application amount to Rs 25. Issuing the press statement, it stated that account holders of the bank can avail the ASBA services from its 58 branch office. The bank will hold the amount of applicants in their respective account while applying for public issues and the allotted amount will be debited once the final allotment of public issue is over.